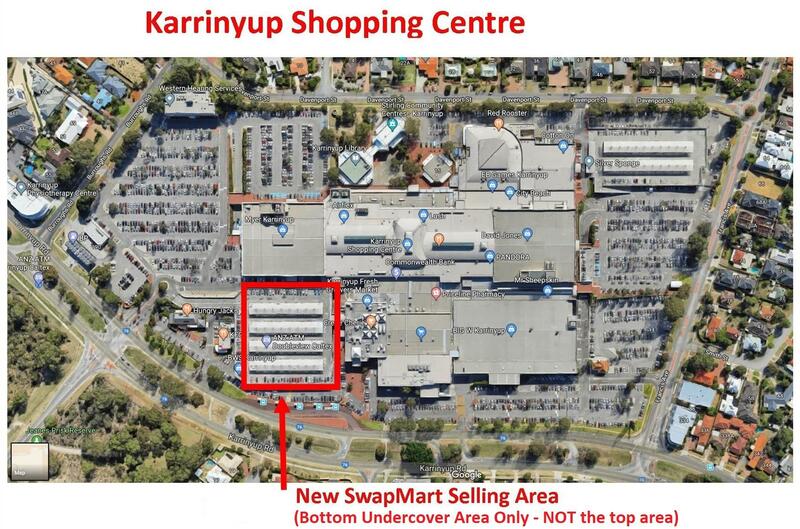 Organised by Scarborough Rotary for the past 31 years, the Karrinyup SwapMart is held every Sunday morning at Karrinyup Shopping Centre unless indicated on this page. SwapMart will take place in the undercover parking area in the area just south of Myers. Sellers: Sellers should consider entering the Casual Sellers queue around 5:00am. They will be given a number to enter the selling area and are admitted into the undercover selling area at 6:05am. Buyers: SwapMart opens at 7:00am to buyers. Entry is $1 and children have free entry. Please leave dogs at home as they will not be allowed in. Sellers are charged $10 per car bay they and their car occupied. The Department of Commerce allows the sale at SwapMarts of pre-used goods, cut flowers and pot plants only. By law, SwapMart sellers are not permitted to sell food, new goods or craft work. For public safety, sellers are not permitted to move their vehicles between 7.00am-10.00am. No dogs are permitted in the selling area. SwapMart is Scarborough Rotary Club’s major fundraising activity and all proceeds go towards Community & International projects. 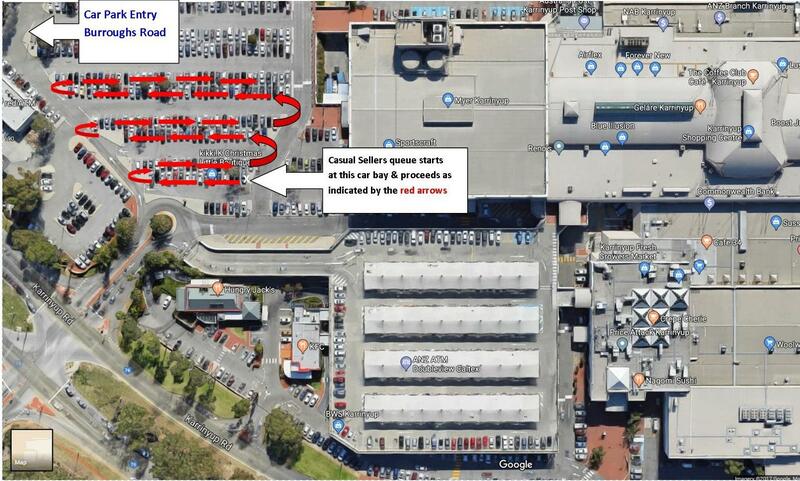 We arrived in the dark at 4.55am and there were already 4 rows of cars parked in the bays at the Myer end of the shopping centre. I spoke to a few people and one them admitted to parking her car at midnight and returning at 6am. A volunteer walked around and gave each driver a numbered sheet to display on the dash. Once inside the area you can choose the bay(s) for your stall. You may either park your car in the bay or unpack then park your car outside of the area (which is cordoned off with mesh). We had 2 cars and chose to park & unpack then relocate the cars. It’s good have a choice of bays but I don’t think it makes much difference where you’re located. Buyers usually do the rounds! We found there was not much time to set up as buyers enter at 7am (and even before that other sellers are walking around to see what you’ve got!). TIP: Have a few racks and trestles to display your goods. Alternatively put a sheet on the ground. The next 3 hours went quickly. Payment is made to a volunteer who comes around to collect $10 per bay. You sign & receive a receipt. Tip: Take lots of coin and change. I was offered $50 notes. I had a bumbag to keep the money safe. Almost every buyer wants a real bargain and will haggle over a $1. As the day progressed we lowered our prices which were already very cheap. The flow of buyers was constant, sometimes 8 people in our 2 bays, other times 1 or 2. We began packing up around 9.40am. Cars are not permitted in the area until after 10.00am. Do NOT take your dog. Hungry Jacks was good for a breakfast burger at 9am! We took chairs to sit on however we didn’t sit down at all so don’t bother! Very well organised by the Rotary Club of Scarborough although I wish there was more information online so I knew what to expect. Hopefully this review will give others an insight into the process and procedures.